Note to Readers: This article first appeared in the 2018 Physics World Focus on Energy Technologies Engineering a sustainable, electrified future means developing battery materials with properties that surpass those found in current technologies. The batteries we depend on for our mobile phones and computers are based on a technology that is more than a quarter-century old. Rechargeable lithium-ion (Li-ion) batteries were first introduced in 1991, and their appearance heralded a revolution in consumer electronics. From then on, we could pack enough energy in a small volume to start engineering a whole panoply of portable electronic devices – devices that have given us much more flexibility and comfort in our lives and jobs. In recent years, Li-ion batteries have also become a staple solution in efforts to solve the interlinked conundrums of climate change and renewable energy. Increasingly, they are being used to power electric vehicles and as the principal components of home-based devices that store energy generated from renewable sources, helping to balance an increasingly diverse and smart electrical grid. The technology has improved too: over the past two and a half decades, battery experts have succeeded in making Li-ion batteries 5–10% more efficient each year, just by further optimizing the existing architecture. Ultimately, though, getting from where we are now to a truly carbon-free economy will require better-performing batteries than today’s (or even tomorrow’s) Li-ion technology can deliver. In electric vehicles, for example, a key consideration is for batteries to be as small and lightweight as possible. Achieving that goal calls for energy densities that are much higher than the 300 Wh/kg and 800 Wh/L which are seen as the practical limits for today’s Li-ion technology. Another issue holding back the adoption of electric vehicles is cost, which is currently still around 300–200 $/kWh, although that is widely projected to go below 100 $/kWh by 2025 or even earlier. The time required to recharge a battery pack – still in the range of a few hours – will also have to come down, and as batteries move into economically critical applications such as grid storage and grid balancing, very long lifetimes (a decade or more) will become a key consideration too. There is still some room left to improve existing Li-ion technology, but not enough to meet future requirements. Instead, the process of battery innovation needs a step change: materials-science breakthroughs, new electrode chemistries and architectures that have much higher energy densities, new electrolytes that can deliver the necessary high conductivity – all in a battery that remains safe and is long-lasting as well as economical and sustainable to produce. To appreciate why this is such a challenge, it helps to understand the basic architecture of existing batteries. 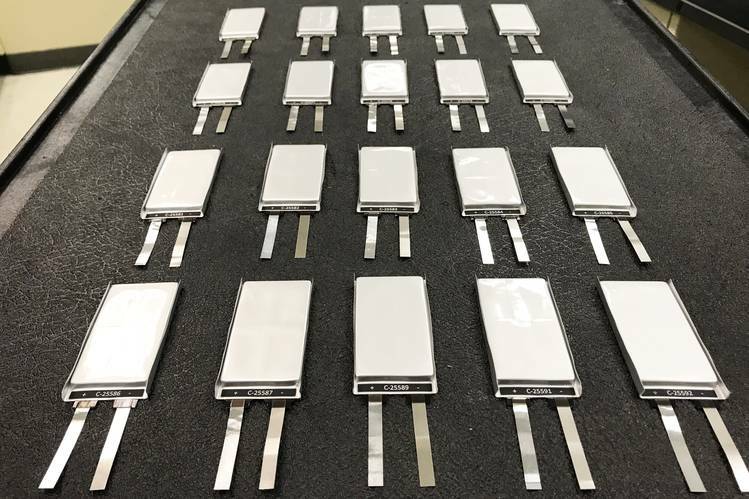 Rechargeable Li-ion batteries are made up of one or more cells, each of which is a small chemical factory essentially consisting of two electrodes with an electrolyte in between. When the electrodes are connected (for example with a wire via a lamp), an electrochemical process begins. In the anode, electrons and lithium ions are separated, and the electrons buzz through the wire and light up the lamp. Meanwhile, the positively-charged lithium ions move through the electrolyte to the cathode. There, electrons and Li-ions combine again, but in a lower energy state than before. The beauty of rechargeable batteries is that these processes can be reversed, returning lithium ions to the anode and restoring the energy states and the original difference in electrical potential between the electrodes. Lithium ions are well suited for this task. Lithium is not only the lightest metal in the periodic table, but also the most reactive and will most easily part with its electrons. It has been chosen as the basis for rechargeable batteries precisely because it can do the most work with the least mass and the fewest chemical complications. More specifically, in batteries using lithium, it is possible to make the electric potential difference between anodes and cathodes higher than is possible with other materials. To date, therefore, the main challenge for battery scientists has been to find chemical compositions of electrodes and electrolyte that will let the lithium ions do their magic in the best possible way: electrodes that can pack in as many lithium ions as possible while setting up as high an electrical potential difference as possible; and an electrolyte that lets lithium ions flow as quickly as possible back and forth between the anode and cathode. The electrolyte in most batteries is a liquid. This allows the electrolyte not only to fill the space between the electrodes but also to soak them, completely filling all voids and spaces and providing as much contact as possible between the electrodes and the electrolyte. To complete the picture, a porous membrane is added between the electrodes. This inhibits electrical contact between the electrodes and prevents finger like outgrowths of lithium from touching and short-circuiting the battery. For all the advantages of liquid electrolytes, though, scientists have long sought to develop solid alternatives. A solid electrolyte material would eliminate several issues at the same time. Most importantly, it would replace the membrane, allowing the electrodes to be placed much closer together without touching, thereby, making the battery more compact and boosting its energy density. A solid electrolyte would also make batteries stronger, potentially meaning that the amount of protective and structural casing could be cut without compromising on safety. Unfortunately, the solid electrolytes proposed so far have generally fallen short in one way or another. In particular, they lack the necessary conductivity (expressed in milli-Siemens per centimetre, or mS/cm). Unsurprisingly, ions tend not to move as freely through a solid as they do through a liquid. That reduces both the speed at which a battery can charge and, conversely, the quantity of power it can release in a given time. Scientists at imec – one of Europe’s premier nanotechnology R&D centres, and a partner in the EnergyVille consortium for sustainable energy and intelligent energy systems research – recently came up with a potential solution. The new material is a nanoporous oxide mix filled with ionic compounds and other additives, with the pores giving it a surface area of about 500 m2/mL – “comparable to an Olympic swimming pool folded into a shot glass,” says Philippe Vereecken, imec’s head of battery research. Because ions move faster along the pores’ surface than in the middle of a lithium salt electrolyte, he explains, this large surface area amplifies the ionic conductivity of the nanoengineered solid. The result is a material with a conductivity of 10 mS/cm at room temperature – equivalent to today’s liquid electrolytes. Using this new electrolyte material, imec’s engineers have built a cell prototype using standard available electrodes: LFP (LiFePO4) for the cathode and LTO (Li4Ti5O12) for the anode. While charging, the new cell reached 80% of its capacity in one hour, which is already comparable to a similar cell made with a liquid electrolyte. Vereecken adds that the team hopes for even better results with future devices. “Computations show that the new material might even be engineered to sustain conductivities of up to 100 mS/cm,” he says. Electrodes are conventionally made from sintered and compressed powders. Combining these with a solid electrolyte would normally entail mixing the electrode as a powder with the electrolyte also in powder form, and then compressing the result for a maximum contact. But even then, there will always remain pores and voids that are not filled and the contact surface will be much smaller than is possible with a liquid electrolyte that fully soaks the electrode. Imec’s new nano-composite material avoids this problem because it is actually applied as a liquid, via wet chemical coating, and only afterwards converted into a solid. That way it can impregnate dense powder electrodes, filling all cavities and making maximum contact just as a liquid electrolyte would. Another benefit is that even as a solid, the material remains somewhat elastic, which is essential as some electrodes expand and contract during battery charging and discharging. A final advantage is that because the solid material can be applied via a wet precursor, it is compatible with current Li-ion battery fabrication processes – something that Vereecken says is “quite important for the battery manufacturers” because otherwise more “disruptive” fabrication processes would have to be put in place. To arrive at the energy densities required to give electric vehicles a long driving range, though, still more changes are needed. One possibility is to make the particles in the electrode powders smaller, so that they can be packed more densely. This would produce a larger contact surface with the electrolyte per volume, improving the energy density and charging rate of the cell. There is a catch, though: while a larger contact surface results in more ions being created and changing sides within the battery, it also gives more way for unwanted reactions that will degrade the battery’s materials and shorten its lifetime. “To improve the stability,” says Vereecken, “imec’s experts work on a solution where they coat all particles with an ultrathin buffer layer.” The challenge, he says, is to make these layers both chemically inert and highly conductive. By combining solid electrolytes with thicker electrodes made from smaller particles, it may be possible to produce batteries with energy densities that exceed the current maximum of around 800 Wh/L. These batteries could also charge in 30 minutes or less. But to extend the energy density even further, to 1000 Wh/L and beyond, a worldwide effort is on to look for new and better electrode materials. Anodes, for example, are currently made from carbon in the form of graphite. That carbon could be replaced by silicon, which can hold up to ten times as many lithium ions per gram of electrode. The drawback is that when the battery is charged, a silicon anode will expand to more than three times its normal size as it fills with lithium ions. This may break up the electrode, and possibly even the battery casing. A better alternative may be to replace carbon with pure lithium metal. 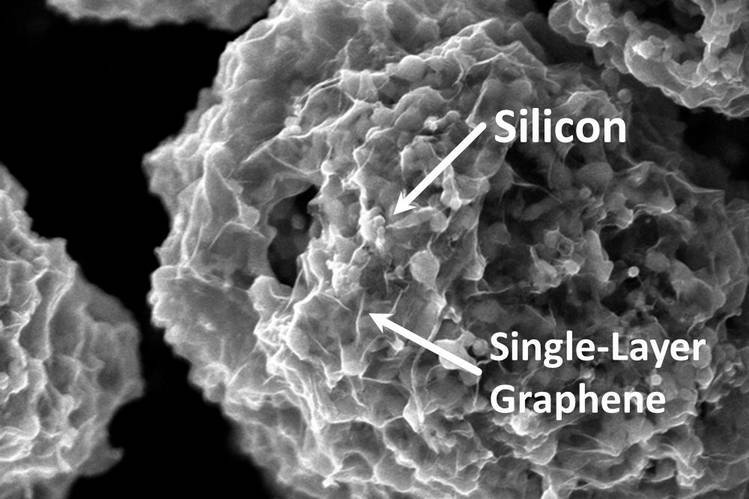 A lithium anode will also store up to ten times as much lithium ions per gram of electrode as graphite, but without the swelling seen in silicon anodes. Lithium anodes were, in fact, used in the early days of Li-ion batteries, but as the metal is very reactive, especially in combination with liquid electrolytes, the idea was dropped in favour of more stable alternatives. Vereecken, however, believes that progress in solid electrolytes means it is “high time to revisit lithium metal as a material for the anode”, especially since it is possible to add protective functional coatings to nanoparticles. Disruptive innovations are on the horizon for cathodes as well. Lithium-sulphur, for example, is a promising material that could store more energy than today’s technology allows. Indeed, the “ideal” lithium battery might well feature a lithium-air (lithium peroxide) cathode in combination with a pure lithium anode. But whereas the material composition of these batteries sounds simple, the path to realizing them will not be so easy, and there is still some way to go before any of these developments will be integrated into commercial batteries. Once that happens, though, huge payoffs are possible. The most obvious would be electrical cars that drive farther and charge faster, but better lithium batteries could also be the breakthrough needed to make renewable power ubiquitous – and thus finally let us off the fossil-fuel hook. The battle over how and where Europeans charge their electric cars is expanding from the cities to the motorway’s and beyond. But if electric vehicles (EVs) are ever to overtake petrol and diesel cars then charging will have to be as easy and simple as filling up. This video takes a look at the growth in electric vehicle charging stations and how the electric car market is forecasted to grow. As the electric vehicle market has grown, the need for more EV charging points has also grown. Have You Watched Tenka Energy’s Video on New Nano-Enabled Batteries and Super Capacitors for the EV Markets? For the last seven years, a startup based in Alameda, California, has quietly worked on a novel anode material that promises to significantly boost the performance of lithium-ion batteries. Sila Nanotechnologies emerged from stealth mode last month, partnering with BMW to put the company’s silicon-based anode materials in at least some of the German automaker’s electric vehicles by 2023. A BMW spokesman told the Wall Street Journal the company expects that the deal will lead to a 10 to 15 percent increase in the amount of energy you can pack into a battery cell of a given volume. Sila’s CEO Gene Berdichevsky says the materials could eventually produce as much as a 40 percent improvement (see “35 Innovators Under 35: Gene Berdichevsky”). For EVs, an increase in so-called energy density either significantly extends the mileage range possible on a single charge or decreases the cost of the batteries needed to reach standard ranges. For consumer gadgets, it could alleviate the frustration of cell phones that can’t make it through the day, or it might enable power-hungry next-generation features like bigger cameras or ultrafast 5G networks. Researchers have spent decades working to advance the capabilities of lithium-ion batteries, but those gains usually only come a few percentage points at a time. So how did Sila Nanotechnologies make such a big leap? Berdichevsky, who was employee number seven at Tesla, and CTO Gleb Yushin, a professor of materials science at the Georgia Institute of Technology, recently provided a deeper explanation of the battery technology in an interview with MIT Technology Review. Sila co-founders (from left to right), Gleb Yushin, Gene Berdichevsky and Alex Jacobs. An anode is the battery’s negative electrode, which in this case stores lithium ions when a battery is charged. Engineers have long believed that silicon holds great potential as an anode material for a simple reason: it can bond with 25 times more lithium ions than graphite, the main material used in lithium-ion batteries today. But this comes with a big catch. When silicon accommodates that many lithium ions, its volume expands, stressing the material in a way that tends to make it crumble during charging. That swelling also triggers electrochemical side reactions that reduce battery performance. In 2010, Yushin coauthored a scientific paper that identified a method for producing rigid silicon-based nanoparticles that are internally porous enough to accommodate significant volume changes. He teamed up with Berdichevsky and another former Tesla battery engineer, Alex Jacobs, to form Sila the following year. The company has been working to commercialize that basic concept ever since, developing, producing, and testing tens of thousands of different varieties of increasingly sophisticated anode nanoparticles. It figured out ways to alter the internal structure to prevent the battery electrolyte from seeping into the particles, and it achieved dozens of incremental gains in energy density that ultimately added up to an improvement of about 20 percent over the best existing technology. Ultimately, Sila created a robust, micrometer-size spherical particle with a porous core, which directs much of the swelling within the internal structure. The outside of the particle doesn’t change shape or size during charging, ensuring otherwise normal performance and cycle life. The resulting composite anode powders work as a drop-in material for existing manufacturers of lithium-ion cells. With any new battery technology, it takes at least five years to work through the automotive industry’s quality and safety assurance processes—hence the 2023 timeline with BMW. But Sila is on a faster track with consumer electronics, where it expects to see products carrying its battery materials on shelves early next year. Venkat Viswanathan, a mechanical engineer at Carnegie Mellon, says Sila is “making great progress.” But he cautions that gains in one battery metric often come at the expense of others—like safety, charging time, or cycle life—and that what works in the lab doesn’t always translate perfectly into end products. Companies including Enovix and Enevate are also developing silicon-dominant anode materials. Meanwhile, other businesses are pursuing entirely different routes to higher-capacity storage, notably including solid-state batteries. These use materials such as glass, ceramics, or polymers to replace liquid electrolytes, which help carry lithium ions between the cathode and anode. BMW has also partnered with Solid Power, a spinout from the University of Colorado Boulder, which claims that its solid-state technology relying on lithium-metal anodes can store two to three times more energy than traditional lithium-ion batteries. Meanwhile, Ionic Materials, which recently raised $65 million from Dyson and others, has developed a solid polymer electrolyte that it claims will enable safer, cheaper batteries that can operate at room temperature and will also work with lithium metal. Some battery experts believe that solid-state technology ultimately promises bigger gains in energy density, if researchers can surmount some large remaining technical obstacles. But Berdichevsky stresses that Sila’s materials are ready for products now and, unlike solid-state lithium-metal batteries, don’t require any expensive equipment upgrades on the part of battery manufacturers. 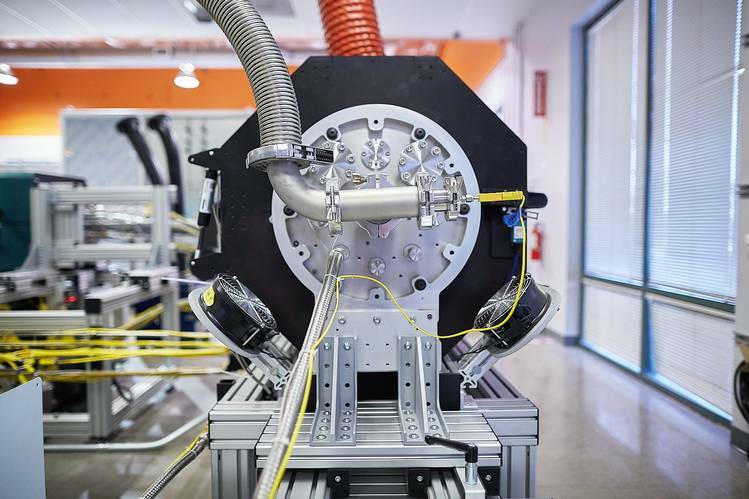 As the company develops additional ways to limit volume change in the silicon-based particles, Berdichevsky and Yushin believe they’ll be able to extend energy density further, while also improving charging times and total cycle life. This story was updated to clarify that Samsung didn’t invest in Ionic Material’s most recent funding round. Diagram illustrates the crystal lattice of a proposed battery electrolyte material called Li3PO4. The researchers found that measuring how vibrations of sound move through the lattice could reveal how well ions – electrically charged atoms or molecules – could travel through the solid material, and therefore how they would work in a real battery. In this diagram, the oxygen atoms are shown in red, the purple pyramid-like shapes are phosphate (PO4) molecules. The orange and green spheres are ions of lithium. A new approach to analyzing and designing new ion conductors — a key component of rechargeable batteries — could accelerate the development of high-energy lithium batteries and possibly other energy storage and delivery devices such as fuel cells, researchers say. The new approach relies on understanding the way vibrations move through the crystal lattice of lithium ion conductors and correlating that with the way they inhibit ion migration. This provides a way to discover new materials with enhanced ion mobility, allowing rapid charging and discharging. At the same time, the method can be used to reduce the material’s reactivity with the battery’s electrodes, which can shorten its useful life. These two characteristics — better ion mobility and low reactivity — have tended to be mutually exclusive. The new design principle has been about five years in the making, Shao-Horn says. The initial thinking started with the approach she and her group have used to understand and control catalysts for water splitting, and applying it to ion conduction — the process that lies at the heart of not only rechargeable batteries, but also other key technologies such as fuel cells and desalination systems. While electrons, with their negative charge, flow from one pole of the battery to the other (thus providing power for devices), positive ions flow the other way, through an electrolyte, or ion conductor, sandwiched between those poles, to complete the flow. A variety of promising solid ion conductors exist, but none is stable when in contact with both the positive and negative electrodes in lithium-ion batteries, Shao-Horn says. Therefore, seeking new solid ion conductors that have both high ion conductivity and stability is critical. But sorting through the many different structural families and compositions to find the most promising ones is a classic needle in a haystack problem. That’s where the new design principle comes in. The new concept can now provide a powerful tool for developing new, better-performing materials that could lead to dramatic improvements in the amount of power that could be stored in a battery of a given size or weight, as well as improved safety, the researchers say. Already, they used the method to find some promising candidates. And the techniques could also be adapted to analyze materials for other electrochemical processes such as solid-oxide fuel cells, membrane based desalination systems, or oxygen-generating reactions. The team included Hao-Hsun Chang at MIT; Douglas Abernathy, Dipanshu Bansal, and Olivier Delaire at Oak Ridge; Santoshi Hori and Ryoji Kanno at Tokyo Institute of Technology; and Filippo Maglia, Saskia Lupart, and Peter Lamp at Research Battery Technology at BMW Group in Munich. The work was supported by BMW, the National Science Foundation, and the U.S. Department of Energy. Hydrogen-electric semi-truck startup Nikola Motor Co. plans to build a $1 billion factory in a Phoenix suburb. The company detailed its plans Tuesday in a joint announcement with Arizona Governor Doug Ducey. The fuel cell truck developer said it will build a 500-acre, 1 million square foot facility west of Phoenix in Buckeye. Trevor Milton, Nikola’s chief executive, and Ducey said the plant will create 2,000 jobs and bring more than $1 billion in capital investment to the region by 2024. Arizona will provide up to $46.5 million in various job training and tax abatement incentives. But the package is performance-based and Nikola benefits only if it makes investments in plant and employees, said Susan E. Marie, senior vice president of the Arizona Commerce Authority. “Arizona has the workforce to support our growth and a governor that was an entrepreneur himself. They understood what 2,000 jobs would mean to their cities and state,” Milton said. Nikola will relocate its headquarters and research and development team from Salt Lake City to Arizona by October. Nikola says it has 8,000 pre-orders for its fuel cell truck. Ryder System Inc. will serve as Nikola’s exclusive provider for distribution and maintenance nationwide and in parts of Mexico. Caterpillar dealer and early Nikola investor Thompson Machinery will supplement Ryder’s sales and services in Tennessee and Mississippi. Nikola said its Nikola One sleeper and Nikola Two day cab trucks will be able to run up to 1,200 miles between refueling stops. The company plans to lease the trucks to users. It will supply fuel as part of the lease cost through a nationwide network of 376 hydrogen fueling stations. It still has to build the network. The powertrain is rated by the company at 1,000 horsepower and 2,000 pound-feet of torque, which analysts said fits the need for long haul trucking. While the factory is under construction truck components company Fitzgerald Gliders will build the first 5,000 production models. Nikola did not provide any details on how it would fund building the factory. But in December, truck components company Wabco Holdings acquired a 1 percent stake in Nikola for $10 million. That deal valued the startup at $1 billion. The company also raised $110 million in a funding round last year. “A key challenge for Nikola is to demonstrate that they can raise the significant capital necessary to be a true competitor in this space,” said John Boesel, chief executive of Pasadena-based clean transportation incubator Calstart. However, Boesel said there is room for Nikola. Nikola has partnered with well-regarded truck components manufacturers, a smart move that builds confidence in potential customers, said Antti Lindstrom, an analyst with IHS Markit. It has tapped parts supplier Bosch for joint development of powertrain systems for the Nikola One and the Nikola Two. Bosch also has worked with Nikola to develop the truck’s “eAxle,” which houses the electric motor, transmission and power electronics. Swedish fuel cell developer PowerCell AB will provide the fuel cell stacks that produce electricity from hydrogen, and Nikola will build the completed fuel cell system. Nikola plans field tests of truck prototypes this fall using the Nikola Two truck and Nikola test divers. Real-world testing with potential fleet customers will come after that. Testing of the Nikola One sleeper truck will begin later. That allows trucks to have a longer range between fueling and enables heavier freight loads, he said. Nikola, however, faces potential competition from well capitalized and mature rivals. Other players include Toyota, which is testing a Class 8 fuel cell electric drayage truck in Southern California. Kenworth, the Paccar brand, is developing a Class 8 hydrogen fuel cell electric truck prototype. A host of companies including Tesla, Daimler Trucks, Volvo Trucks, Navistar and Cummins are working on electric trucks that could compete with fuel cell commercial vehicles. Milton said Nikola settled on Buckeye following a 12-month site selection process that considered nine states and 30 different locations. He said he liked the city’s economic environment, engineering schools, educated workforce and geographic location that provides direct access to major markets. “The Greater Phoenix region is elevating its brand as a hub for innovation, and companies such as Nikola have taken notice,” said Chris Camacho, chief executive of the Greater Phoenix Economic Council.